For girls, school-sponsored programs are mainly in High Schools (grades 9th thru 12th). It is a selective program run in the fall with tryouts in early August to fill two or three teams: Varsity, Junior Varsity (JV) and often Freshmen. Immediately after tryouts, teams practice or play 4-6 times a week until school begins and continue after school all the way though playoffs in November. Matches are typically scheduled twice per week against regional schools of a similar size. 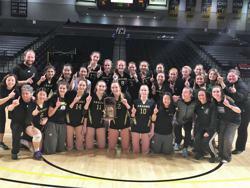 For public schools, girls volleyball is governed by the Virginia High School League (VHSL) with schools across the state grouped by Class (size), Region and District with only like-sized schools competing against each other. For private schools, there are several regional athletic conferences. Most teams play in a Virginia-wide playoff organized by Virginia Independent Schools Athletic Association (VISAA) which groups schools into three divisions based on size. For boys, volleyball is no longer a public school-sponsored sport in Northern Virginia. Instead, it operates through the Northern Virginia High School Boys Volleyball League (NVHSBVL) during the fall season. Most teams hold tryouts in late summer, practice 2 to 3 times each week after school, and play roughly 2 matches per week against other league teams between mid-September and early November. Paul IV HS in Fairfax is currently the only school in NoVA with a varsity boys volleyball team. Below are the VHSL districts in Northern Virginia including the high school's county / school district. There are several regional private school athletic conferences where schools compete against each other. Some span across DC, Maryland and other parts of Virginia. Virginia teams also play in a state-wide playoff through VISAA in three divisions based on size. Below are the Northern Virginia schools including known conferences. Paul VI Catholic HS is the only regional school that fields a HS boys volleyball team. It has won the Independent School Volleyball League (ISVBL) title 6 of the past 10 years.